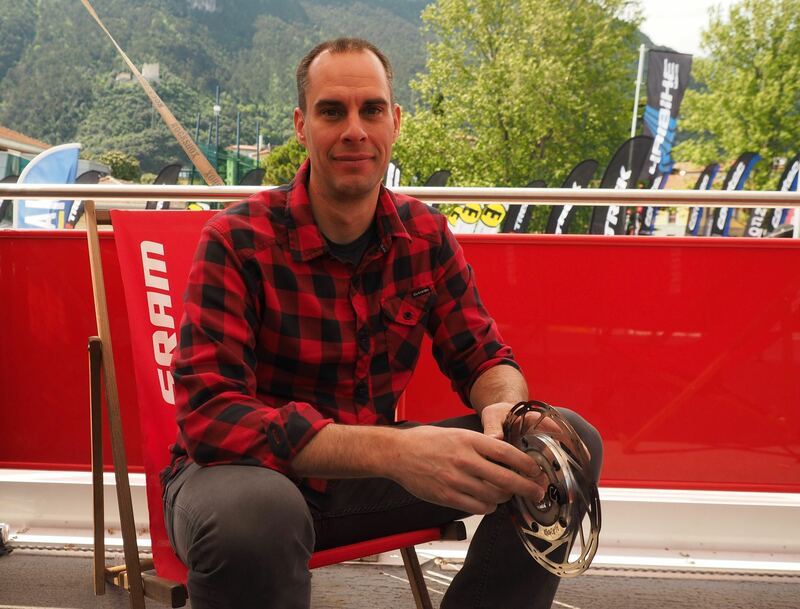 In amongst all the freshly announced product and e-bikes on show at Bike Festival Riva the thing that captured our interest the most was a new method of testing brakes, and the received knowledge around braking, that SRAM have quietly developed. Taking advantage of the experience gained from their Quarq range of power meters they have developed a simple, yet suitably complex, power rotor allowing them to quickly and efficiently capture real world brake data as part of their development process. We took the opportunity to quiz Brake Product Manager James Alberts about what they have learned. RADventure: This isn’t the wire strewn data logging test rig we’re used to seeing in development photos. James Alberts: We do a lot of data acquisition as part of development, we’ve built a big fancy data acquisition bike, but to have a lot of people ride that bike, swapping stuff around, takes a lot of time. So that limits the amount of data you can gather. We found that the things we were curious about, the amount of power, the number of times you use the brake and how frequently it travels in a rearward direction – so the power, the loading, and cycles, and this helps us capture all of that. We can just send the rotor to someone, a device to capture it and upload it to the internet. It’s basically just a Quarq power meter core, an aluminium shroud around it and a spider to bolt on different rotor sizes. We have custom software to let us sample at a higher rate. It’s pretty much just as simple as it seems. 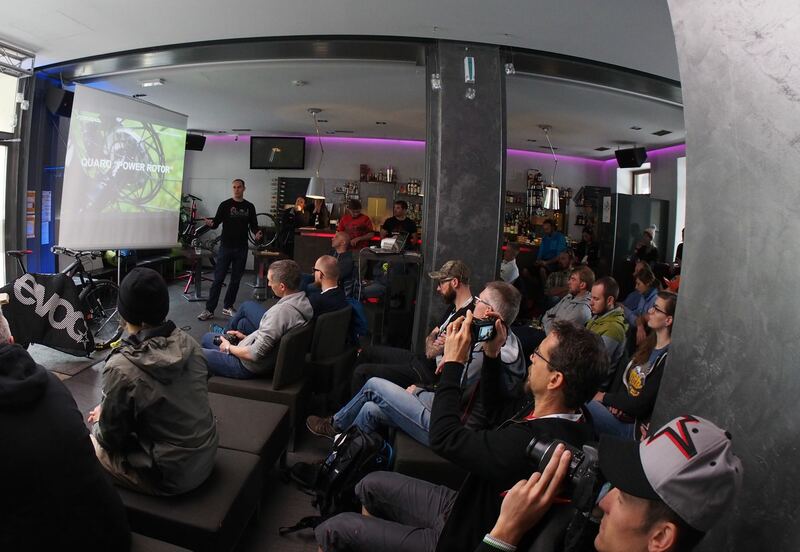 Us having Quarq in the SRAM family, its uniquely us and helps us solve problems and design better products easily. It’s been really helpful to understand the difference in braking between an e-bike and a normal bike. 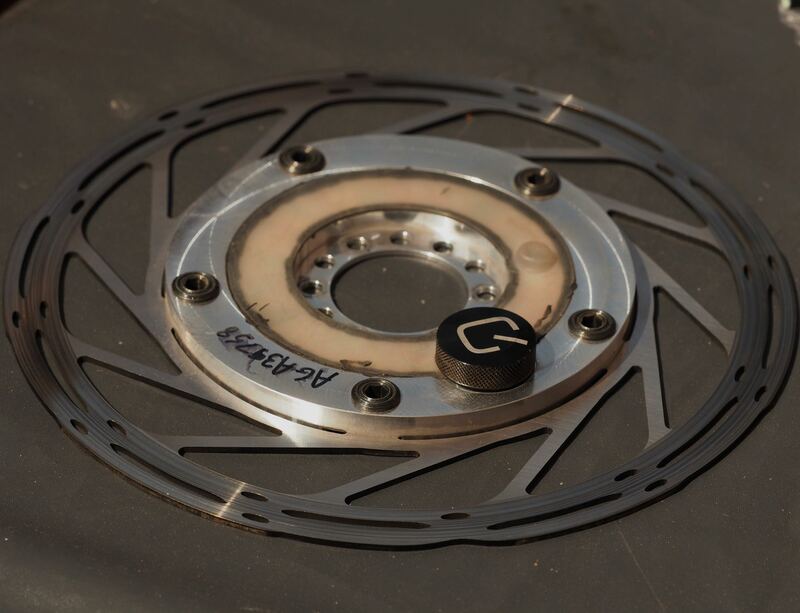 Being able to swap it around and do a lot of data gathering in the same environment out in the real world really helped us paint a picture of how to design a brake to address those differences. How fast does it sample? Faster than a usual one (laughs). It’s fast enough to pick up all the peak load events, to catch a peak loading event and to pick up the maximum wattage that’s coming out of the system. And pick up people trailing a brake? It’ll do that. If you’re coming into a corner, trail braking then letting off, you can see the curve behaving as you’d expect. If you’re skidding it doesn’t work, but it does capture what’s happening to the caliper still. If you’re skidding the rotor is still moving back and forth so there’s power going in and out of it still. It’s pretty interesting to know that. We have tests that load everything in a backwards direction,because it happens frequently when you ride a bike. The brake does a lot of work in that direction so it’s important to design it for appropriate loads. So with the brakes locked up are you still putting heat into the system? So, you’re not making any more heat, but you’re moving that heat from your hot pad into your rotor – you put a high spot right there. Once you’ve locked everything and you’re skidding, it’s just going to put heat into the rotor from the pad. If you’re at the bottom and you leave your brakes on you’ll deposit a tiny amount of material on there right where the pad is sitting, do it enough in the same spot and you’ll get a hop in the rotor. There’s not really a lot more to it than that, but it’s helped us answer a lot of questions we had in the test lab with testing that reflects the real world, so we’re a lot clearer about how we test things. And have you found out much about people’s braking behaviour? That is something we see. With two rotors on the bike, and two channels of data we can see which is which – front versus rear. One of the things we’ve proved is that people use the rear brake all the time. If you think about it there’s all the power at the front but people don’t get the most out of it, they’re comfortable using that rear brake because it’s underneath them – if you skid it’s fine, so it’s a comfortable thing for folks. You can see it in the data, just about everyone uses their rear brake to control themselves. So you need a lot of power at the rear of the bike. That’s why we recommend you have at least the same size rotor front and back, because you’ll be happy having that power at the back, it’s going to feel more powerful and more confident. It’s not going to deliver all it’s power, but it’s the one most riders use to control themselves. So does the front see higher loads and the rear greater duration? That’s a fair assessment. You can deliver a ton of power with the front brake, but it takes a pretty talented rider to get the most out of it. If you’re dumping a lot of weight forward, and still have traction you can get a lot of power out of it. We saw the same thing between an e-bike and a normal one – you’re limited by traction, but people start to use the front brake more on an e-bike because you have to slow that thing down. So that tells us we need more power and a big brake system for the e-bike. And that the rear brake is as important as the front brake, people use all the power of the rear brake, once that runs out they then move to the front brake to slow themselves down. And is there a difference with the way pro’s are using their brakes? They’re really good at using the front brake. They understand how to manage their traction and they have an easier time defining where the edge of that traction is. So most people are scared of letting that front wheel let go. Pro’s are really good at managing it to get the bike to go faster. You can see that in the data for sure. We make a point of testing different riding styles, we didn’t just put this on someone who’s a really good bike rider, we put it onto peoples bikes who fit the profile of who will be using the product. When you put it onto someone who’s new to the sport you see they use the brake less but then pull hard on the brake lever because if they’re riding in a technical section they freak out. You see it in the data it changes across the spectrum then there’s a big jump to the end where the pro’s are. There’s a lot of short intense braking moments, just like racing drivers. Do people’s braking styles change between wheel sizes? What you find is you can get more traction (between sizes) so you can apply a slightly greater braking load, but it becomes easier to use the front brake. So you see slightly more front brake use with a 650b plus tyre than a 2.3″ 29er. So a 29er with 2.3″ skinny tyres to a plus sized e-bike has two different brake use patterns for sure. You do see differences, basically in how much lever load people are putting into their brakes. In steep stuff there’s less lever load with bigger rotors. We all think it, but it’s nice to have the data to back it up. So in the future. You can tell when the bike locks up, that surely lends itself to anti lock braking? Well, it could. We have an algorithm we run post processing to give riders a skid score, so we can give you a score for the amount of time you spent skidding on a ride. And if you get the power rotor talking to the power meter talking to Shockwiz? I’m sure no-one has thought of that or done it. Thanks to James Alberts and SRAM.